Homes cramped with knick-knacks and frilly furniture is a thing of the distant past. Now it’s all about making home areas as spacious as possible. Turning to drastic renovations to add space to your home isn’t always an option that most budgets can allow. It doesn’t have to be the only option either. There are ways to create the illusion of more space through a decorative concrete floor. How you may ask? Continue reading to find out! Make it right, make it bright. When you want to make a room look wider than it actually is, you need as much light as possible. You can achieve this with decorative concrete finishes that increase the brightness of a room. A stained concrete floor has a luminous finish that adds brilliance and luster to any area it’s installed on. Another option is epoxy resin coating. Epoxy coated floors are known for its light-reflective quality that can increase brightness by approximately 300%. This is also an energy saving option for those who want to reduce the use of artificial lighting. Go for a seamless look. Breaking up rooms with different flooring for each area certainly doesn’t help. It makes open spaces look limited with boundaries even without doors or partitions. What you want is a solid and continuous flooring to get a seamless look. You can achieve this with epoxy coating, concrete polishing, and concrete staining. These floor finishes can be applied throughout the whole area and left as is. 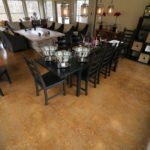 All you have to do is to choose depending on your concrete flooring needs. Epoxy coating, however, is the best option for an opaque seamless look for floors that need coverage. 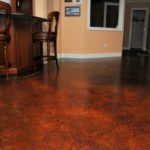 The color of your concrete floor is another visual element that you need to keep in mind. Dark colors can make already small spaces look even smaller. As to the use of multiple colors. Varying colors can optically interrupt a continuous flow. 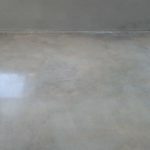 If you think a solid color is too plain, acid concrete stains are reactive and have a distinct effect that adds depth and movement without being distracting. So does metallic epoxy that can be left as is or styled to mimic the look of granite. Textures can compensate for the simplicity of monochrome colors. Bare it all with the raw concrete trend. A popular trend in contemporary homes is leaving a bare concrete floor in all its naked glory. It’s a great affordable option that results in a dramatic effect for that bold but minimalist look. However, we’re not talking about completely leaving your concrete floors as is. Concrete polishing needs to be done to buff out the roughness. Depending on your preference, the floors can be polished to a matte, satin or high-shine finish. The result is a beautiful seamless concrete floor with a natural color and a distinct texture. Talk about industrial-chic. 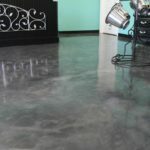 Need services for your concrete floor in Dallas? Visit our homepage to find out more!